Remember all of your favorite foods that you loved as a kid? Well who says you can’t have them now too. Enjoy making this with your family or friends. The kids will love being involved in it. Let them crush the cereal or shake the bag. Mine like pressing their thumb in the cookies to add the jelly. Just enjoy the togetherness. Maybe choose a great kid movie to watch too. Preheat oven to 450°F. In a resealable plastic bag, combine crushed cereal, paprika, garlic powder, oregano, and, if desired, cayenne pepper. In a small bowl, beat egg whites with a fork. Dip chicken pieces into egg white, Then add to the bag with dry mixture. Seal bag and then shake to coat all pieces. The kids will love helping with this part. SHAKE n BAKE!!!!! 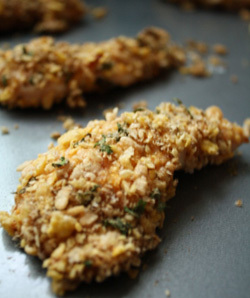 Place chicken pieces in a single layer on a baking sheet. Bake for 7-10 minutes or until juice runs clear. Preheat oven to 450 degrees. Spray 4 individual baking dishes or 1 medium dish with non-stick spray. Place baking dishes on a baking sheet to make it easier to remove from the oven. Bring a large pot of water to a boil. Cook the cauliflower until very soft (about 10 minutes). Remove cauliflower and add the pasta to the same water. Cook pasta per instructions. Drain pasta and set aside. In a bowl, combine the egg, milk, mustard, and garlic powder. In the pot used to cook the noodles, (which should now be empty), pour the egg mixture and cheeses (except parmesan cheese) in. Cook cheese and egg mixture over medium-low heat, whisking constantly, until the cheese melts and the sauce begins to thicken. This will take about 5 minutes. Blend the cheese sauce with the cauliflower in a blender until smooth. Add the pasta to the sauce and broccoli if using and stir. You may season with salt and pepper if you’d like to. 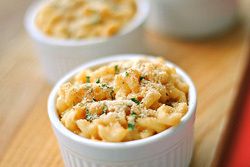 Scoop the macaroni evenly divided into the serving dishes. Sprinkle the Parmesan cheese on top of each. Bake macaroni for 15 minutes, or until Parmesan becomes golden brown. Remove and let cool for about 5 minutes. This is a good time to cook the chicken while it’s cooling. Mix everything together in a bowl. I like to mix wet ingredients (egg whites and peanut butter) together first to make mixing easier. Roll dough into 8 equal size balls. Place on a non-stick sprayed baking sheet. Press thumb into each cookie and put 1/2TB jelly into each. Bake until cookies are golden brown. Will be about 11-15 minutes at 425 degrees. These cookies spread a bit but not that much in the oven.